The Humanitarian Information Unit (HIU) has released several new datasets that leverage the Office of the Geographer‘s work on mapping International Boundaries. The Large Scale International Boundaries (LSIB) dataset, maintained by the Geographic Information Unit (GIU), is a vector line file that is believed to be the most accurate worldwide (non-Europe, non-US) international boundary vector line file available. The lines reflect U.S. government (USG) policy and thus not necessarily de facto control (cited from metadata attached to files). In September 2011, the HIU first released the boundaries publicly for download. Working with colleagues at DevelopmentSeed after that release, they made some substantial improvements to the underlying data structure that helped lead to this work. The LSIB dataset is designed for cartographic representation and map production. However, this poses a problem for GIS analysis, because the dataset is only composed of vector lines of terrestrial boundaries between countries. This means they do not contain coastlines, and could not be converted into polygons for GIS analysis. To address this issue, the HIU combined the LSIB dataset with the World Vector Shorelines (1:250,000) dataset. The combination of these two datasets is one of the highest resolution country polygon datasets available. Additionally, the LSIB-WVS polygon file is believed to be the most accurate available dataset for determining island sovereignty. It corrects the numerous island sovereignty mistakes in the original WVS data (cited from metadata attached to files). Two other modifications were made to the datasets. First, the large cartographic scale of the data also introduces a problem in that the data are too detailed for global scale mapping. Therefore, the HIU also created “generalized” versions of the original LSIB-WVS polygons that are suitable for smaller scale mapping. Second, in order to facilitate the ability to “join” data to the polygons in a GIS, several attributes were added to the database, including Country Name and several ISO 3166-1 Country Codes (ISO Alpha 2, ISO Alpha 3, and ISO Number). After a year of work, the data have been released into the public domain. Note, both the polygon and line datasets are useful for cartographic representation. This is due to the variety of different boundary classifications that are in the LSIB. Below is a subset from the metadata attached to the datasets that describes USG cartographic representation of the boundary lines. b) A rank of “3” for other lines of international separation. Most are considered by the US government to be in dispute. c) A rank of “7” for other lines of separation such as DMZ’s, No-Mans Land (Israel), UNDOF zone lines (Golan Hts. ), Sudan’s Abyei, and for the US Naval Base Guantanamo Bay on Cuba. Any line with a rank of “3” or “7” is to be dotted or dashed differently and in a manner visually subordinate to the normal rank “1” lines. Additional information about how the LSIB dataset is produced, and the processes that went into the production of the new datasets are included in the metadata. My PhD dissertation at the University of Kansas is entitled “The Disruptive Potential of GIS 2.0: An application in the humanitarian domain”. The research involves several interrelated philosophical, technological, and methodological components, but at its core, it is about building a new way to harness the power of geographic analysis. In short, the idea is to show how Geographic Information Systems (GIS) has evolved into something different than it was before, explore the dynamics of that evolution, then build new tools and methods that capitalize on those dynamics. The foundation of the argument is that a new generation of digital geographic tools, defined here as GIS 2.0, have completely changed how core GIS processes are implemented. 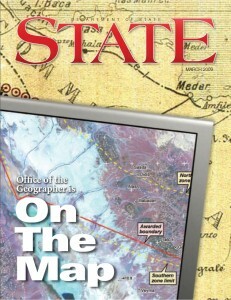 While the core functions of a GIS remain the same — the creation, storage, analysis, visualization, and dissemination of geographic data — the number of software packages capable of implementing spatial functions and the distribution capacity of the Internet have fundamentally changed the desktop GIS paradigm. Driving GIS 2.0 is a converging set of technology trends including open source software, decreasing computation costs, ubiquitous data networks, mobile phones, location-based services, spatial database, and cloud computing.The most significant, open source software, has dramatically expanded access to geographic data and spatial analysis by lowering the barrier to entry into geographic computing. This expansion is leading to a new set of business models and organizations built around geographic data and analysis. Understanding how and why these trends converged, and what it means for the future, requires a conceptual framework that embeds the ideas of the Open Source Paradigm Shift and Commons-based Peer Production within the larger context of Disruptive Innovation Theory . The core arguments of GIS 2.0 were originally conceived during 2006-2008, so they are a bit dated now. At the time there was really only anecdotal evidence to support the argument that the same Web 2.0 forces that built Wikipedia and disrupted the encyclopedia market were going to impact GIS. However, with the continued rise of FOSS4G, OpenStreetMap, and now the Humanitarian OpenStreetMap Team (HOT), it feels almost redundant to be making this argument now. Additionally, from the technology perspective there are lots of individuals and groups out there doing more cutting edge work than I ever will, but I hope the combination of philosophical approach and actual implementation can be a contribution to the discipline of geography — and more importantly, help the humanitarian community be more effective.